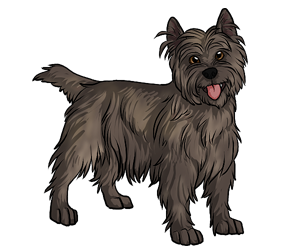 The Cairn Terrier, originally from the Highlands of Scotland, is one of the smallest and oldest terriers in the world. Also originating from the Isle of Skye, they were grouped in the "Skye Terrier" with the Scottish and West Highland White Terriers. However, in the 1900's the breeds began to be bred separately. The name "Cairn" refers to the rock dens that foxes and badgers lived in throughout the countryside that the dog would squirm down. Toto from The Wizard of Oz was a Cairn Terrier. Cairn Terriers are a Hollywood pet; Many actresses own them and a Cairn featured in Pal Joey. Allergic to many things, including fleas, due to selective breeding.